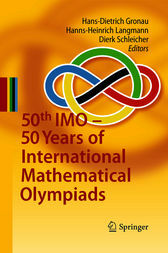 In July 2009 Germany hosted the 50th International Mathematical Olympiad (IMO). For the very first time the number of participating countries exceeded 100, with 104 countries from all continents. Celebrating the 50th anniversary of the IMO provides an ideal opportunity to look back over the past five decades and to review its development to become a worldwide event. This book is a report about the 50th IMO as well as the IMO history. A lot of data about all the 50 IMOs are included. We list the most successful contestants, the results of the 50 Olympiads and the 112 countries that have ever taken part. It is impressive to see that many of the world’s leading research mathematicians were among the most successful IMO participants in their youth. Six of them gave presentations at a special celebration: Bollobás, Gowers, Lovász, Smirnov, Tao and Yoccoz. This book is aimed at students in the IMO age group and all those who have interest in this worldwide leading competition for highschool students.